A few of the plates we've washed yesterday and today. Washing a giant pile of dishes the other day made me realize how much charity is connected to faith. Not faith like, "only holy people who have faith in X religion can truly be charitable" --- I don't mean that at all. No, I mean that it struck me, as I was washing a pile of plates that I'd given to my church, that giving away my money (time, energy, whatever) to try to make the world a better place takes a bunch of faith that my gift will actually make a difference. I'm pretty sure we all wonder about this. That's part of why sites like Charity Navigator and GiveWell exist; to help people figure out whether, or to what extent, their money might actually feed people, or cure people, or provide education/environmental protections/emotional healing/etc. Giving locally makes it possible to close the feedback loop a bit more tightly -- that is, to see the actual effect that a donation has. 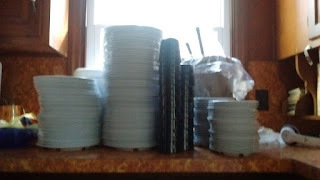 A few years ago, I donated 100 reusable, washable plates to my church, in hopes that I could reduce the bags and bags of trash that accompanied our occasional communal meals. 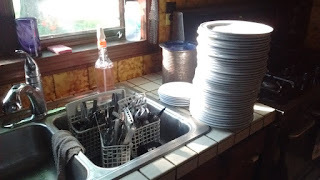 Our church doesn't have a dishwasher, so I also offered (and continue to offer) my services in washing those dishes. But even so, the gift came with a bit of cross-fingers on my part. Would people be willing to use these plates instead of the more "convenient" disposable paper plates? Or would they grumble at the hassle of storing these plates, of setting up collection bins after meals, of sorting plates and silverware into one bin, cloth napkins (oh, yeah, I got those for the church, too) in another bin, and landfill-bound trash in another? clean cloth napkins(in the laundry basket on the ground). Prewash the Dog lurks expectantly in the background. Well, those plates were successful enough that the church lunches grew in size, and I ended up ordering and donating even more plates. More napkins. More tableware. People at church started telling me that they think about the trash they throw out at home because of me. I'm not sure they're changing anything they do, but at least they're thinking. Then, when our church ESL classes kicked into high gear, I ordered/donated a bunch of stackable mugs, which these days make an almost-weekly trek between the church and our dishwasher. People have used my plates for weddings. For funerals. For general gatherings. I have to say, I'm so happy. I'm happy even though I'm surrounded yesterday and today by piles of dirty dishes. It's just wonderful to know that this action of mine is making a difference outside of my own home. just about ready to go back to church. This year, the ESL team decided to use the plates for their end-of-year party --- a party that in previous years has generated bag-upon-bag of landfill-bound trash. The challenge is that this was with a group of people who are unfamiliar with a lot of aspects of the environmental movement, and who understandably appreciate the convenience of disposable items. Why bother to haul plates around, wash, dry, stack, when you could just toss something in a bin and be done? 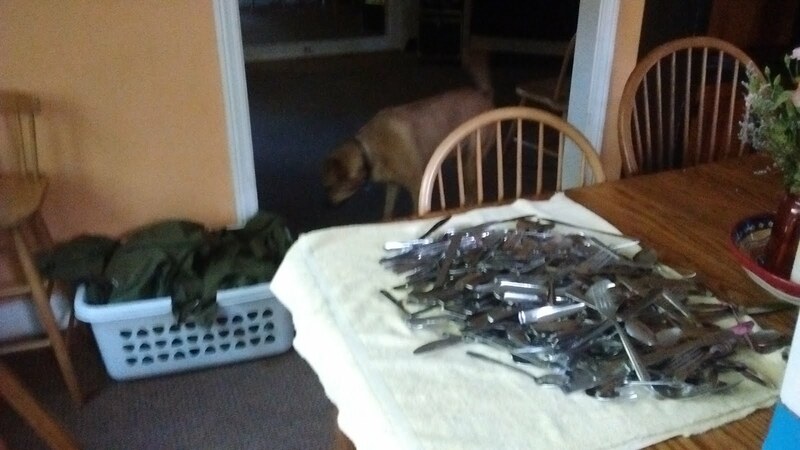 And there's no denying it's a bunch of work cleaning up for a dinner that serves more than 100 people. We ended up doing a giant laundry load of napkins, and five dishwasher loads of dishes. The total trash output of the evening was about one large bag, and it was mostly plastic tablecloths that weren't within our control. Remembering the absolute mound of trash from last year, I'd say we did well!! I even think that folks are coming around to the "fun" of it; several asked how much trash we ended up with since we were all being so very aware of where to place what. AWESOME! It's super gratifying to be able to see the effect I'm having by sharing my money (and my trash-averse rants) locally. I miss having that kind of feedback when I send my money farther afield. Which is where the faith comes in. I know that sharing money locally helps people who are -- by global standards -- already pretty darned well off. So I'm just going to have to extrapolate, cross fingers, that the checks I write for refugees, orphans, plants and animals, and struggling entrepreneurs in other parts of the world will be as effective. And maybe the trash we didn't send to the landfill this week will slow the degradation of this planet we all share. Reminds me of the passage in the New Testament; James 2:14-26 Good job! Such a loving series of donations, your community is very lucky! I've pondered this exact same thing - I'm not a person of organized religious faith so much, inculcated by culture more than personal faith, but I do harbor what I'd consider to be an unusual amount of faith that what we try to do to help is actually making a difference. I think it's fantastic that your original idea has fostered so much more thought and consideration beyond your initial donations!